Ernest Holland was born in Nottingham on 10th September 18951. By the time of the 1901 census, the Holland family had moved to Beeston and were living at 31 Hawthorne Grove. The head of the family, Alfred, who was born in Nottingham, was then working as a lace maker. Ernest's mother Janet, who was born in Edinburgh, was employed bringing up the two children, Ernest had a sister Ethel who was two years older than her brother2. Ernest Holland spent his education years at the Nether Street School and, at the age of thirteen, he left the to work for the Topham Brothers. At the age of 14 he enrolled in newly formed 17th "Beeston" Nottingham Boys Brigade Company, which operated various classes in rooms at the premises of the Anglo Scotian Mills Company in Albion Street. He was the second boy to join the 17th, when the club opened on May 1st 1909 and he took part in the classes and all the activities offered to the young lads from the area. He achieved the rank of sergeant. Later, he joined the "Old Boys". It was during these years that he was back at Nether Street - all young men who had left school were required to attend Evening classes as part of their training in the Beeston Boys Brigade. By this time, the family had moved to "Dunoon Villas", 31 Fletcher Road, Beeston, Notts. In 1910 the Beeston Old Boys was formed for young men who had reached the age of eighteen and who were too old for the Boys Brigade. The 17th Boys Brigade Company moved to Station Road in 1913 with the "Old Boys" sharing a room in the building which was always known as the Beeston Lads Club. Ernest Holland left the "Old Boys" to join the Army and served in the ranks of the South Nottinghamshire Hussars. On the 29th July 1913, all this was to come to an end as he left for Australia aboard the Port Lincoln, which left Tilbury for Melbourne3. After arriving in Australia Ernest Holland found work as a farm labourer when he was only eighteen years old. He later moved to the state of Victoria and then found employment as a trainee dairy farmer in the state of Queensland. He remained in this occupation until the outbreak of the war and, during this time, he married Gertie, his employer's daughter4. Initially, the 31st Battalion was sent to Egypt where it was involved in the defence of the Suez Canal against the Turks. The 8th Brigade joined the newly raised 5th Australian Division in Egypt, and proceeded to France, destined for the Western Front, in June 1916. It would not have been long before thet Ernest Holland attained the rank of Sergeant-Major. The 31st Battalion fought its first major battle at Fromelles on 19th July 1916, having entered the front line trenches only 3 days previously. The attack was a disastrous introduction to battle for the 31st Battalion; 572 Officers and men became casualties, over half of its strength. It was during this battle that Company Sergeant Major Holland was himself one of the wounded. 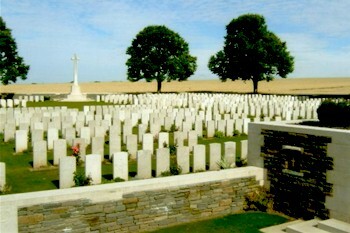 Although the battalion spent periods in the front line, it played no major offence role for the rest of the year. It was during this period that Ernest Holland was wounded again. As a result, Blighty was his next port of call; he spent some time in England on sick leave, where he had a chance to visit friends and family. At Christmas 1916, he was to visit his parents for the last time, returning to rejoin his unit in early 1917, as it prepared for the next big attack. On March the 13th the British and the Australians advanced towards the town of Bapaume, where the Germans had strengthened their line, bringing in a crack regiment of Prussian Guards. From the west and south-west approaches to the town, Australian and British patrols came forward with ladders, bombs and machine guns. They scrambled over the unbroken enemy wire and, in a short action, scattered the Prussian Guards. As one enemy company fled, it was caught in continuous machine gun fire and annihilated. After bitter fighting the Australian infantry finally captured Bapaume. Unfortunately this was to be Company Sergeant Major Holland’s last action; he died on the 14th and was buried in Beaulencourt British Cemetery. 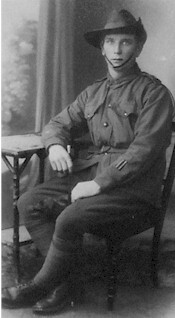 He left a grieving wife Gertie back in Australia and also his family back home in Beeston, Ernest Holland was one of the two ex Boys Brigade members from Beeston, who had emigrated to the Commonwealth and were involved fighting with the Australian Infantry. L.J. Holmes, who had previously moved from Beeston to Lenton, was the other. 1It is possible, based on the index of birth records, that his full name was Harold Ernest Holland, The family was living at 10 Florence Terrace, Nottingham at the time of his sister's baptism. 2Census Piece 3153 Folio 160. At the time of the 1901 census, an otherwise unidentified young boy of seven named Frank Moore was a visitot in the house. 3The SS Port Lincoln could carried up to 635 passengers. She was built in 1912 with a tonnage of 7243 gross, a length of 426ft, a beam of 54ft and a service speed of 13 knots. One of two sisters. In January 1914 she was transferred to the Commonwealth & Dominion Line on its formation. On 2nd November 1942, then named the Maritima and while part of convoy AC 107 (Sydney -Nova Scotia-UK), she was torpedoed by U-552 500 miles north of St Johns, Newfoundland. SC 107 was one of most disastrous convoys of the Secon World War, suffering 34 attacks with the loss of 20 ships. 4His wife's address is give as Healy St, Toowoomba, Queensland, Australia, on his CWGC record.